With the Sega Genesis Ultimate Portable Game Player in your hands from AtGames you can take with you classics like Sonic the Hedgehog 2, Alien Storm, Mortal Kombat and so much more. I am a geek. I say it loud and proud, and you can share that with whoever you want. I dare you! Go ahead, share this post! While it lists 85 games, only 40 of them are original Sega Genesis Games. While the other games might be a good distraction for children, die-hards like me would wish they were all original games. It retains the 6-button set-up of the vintage controller so that you have the same play you remember when you tried it the first time. that you can load Sega Genesis games onto you can increase your gaming library by quite a bit. Downsides? The sound quality could be better. I am not saying that it totally detracts from the playability of the games, but it would be nice to have a clearer sound.
. The Sega Genesis is part of vintage gaming history. Did I mention it’s portable? I love gadgets like this that can make waiting to see the doctor pass a little easier, or when you have downtime on vacation in the room, or just if you are out to beat your last high score on your favorite game. I was a Sonic freak lol! !My daughter loves Sonic now and she makes Mama proud! !She would love this!! I am not a fan of gaming consoles. I think in moderation they are great entertainment, but too many children and adults have problems putting the games down and enjoy their lives. As a parent with hearing issues and three kids, I kind of like that the sound is sub-par but, completely understandable why it would be a con LOL. My kids would thoroughly enjoy this game player and, I admit, I would sneak in some time too. I’ve never been much of a gamer but I did play Sonic. It was always a lot of fun. And I might even enjoy playing Sonic again. I understand that not all of them are original games and that is disappointing. But I am thrilled there are as many original games as there are! Such memories! I need to get this and indulge in the nostalgia. So cool & nostalgic! My kiddos would probably enjoy this the most but their father & I would most definitely love it too! I used to love playing Sonic & other retro games like Ms. Pac-Man. Thanks! Tom I defer to your superior knowledge. I wouldn’t know Sega from Parsnips, but I bought this for my niece and she’s siadto be thrilled. I had a Sega only for the briefest time. House burned. I got another house eventually, but I never had another Sega. Heavy sigh. S’pose it’s too late? Me neither! #Sonicrocks! I have played sonic ever since it came out! I would love to own 1 of these! !looks FUN!!! I would so steal this game from my kids. I use to love playing sonic the hedgehog, mortal kombat and dr robotniks beans. This would be fought over in my house and on trips. My son absolutely loves Sega. He really loves Sonic the hedgehog. I know some kids who would enjoy this! I am all about vintage games. I love being reminded of times in the past and gaming was definitely a part of that past. I love that this is portable also. Oh myyy! I want this. Some of my favorite games including Sonic the Hedgehog and Mortal Kombat. Was always surprised that the sega never took off like other consoles. Compared to the others, the sega was a beast. Sega was a staple for my husband and I when we first started dating. We would play Sonic and then SNES all the time. My kids love the “retro” games. This looks like something my son would go nuts over. My college age son is a huge gamer. He used to love Mortal Kombat and Sonic. We are gamers too. I used to love playing the Sonic games. This is a great gift idea! This would be great to keep in the car for longer trips. Love that it has those “vintage” games! We so far do not have a play station. I’m sure my kids would love this. I like that it’s portable. My kids and I would just love this. When I was a kid I had so much fun playing Sonic and Simpsons games on it. ALWAYS LOVE GAMES FOR ME, THE KIDS, AND GRAND KIDS. SOMETHING TO PUT ON SANTAN’S LIST THAT IS AFFORDABLE. THAT YOU FOR YOU REVIEW. I’m not sure if my 13 year old son or myself would love this more as a Christmas gift!! I love the old arcade games; Sonic is definitely my favorite game of all time! Very well written review! Thank you! I like that this game is portable. It has some of the video games that I grew up with like Pac Man and Sonic. My boys would love this for Christmas. 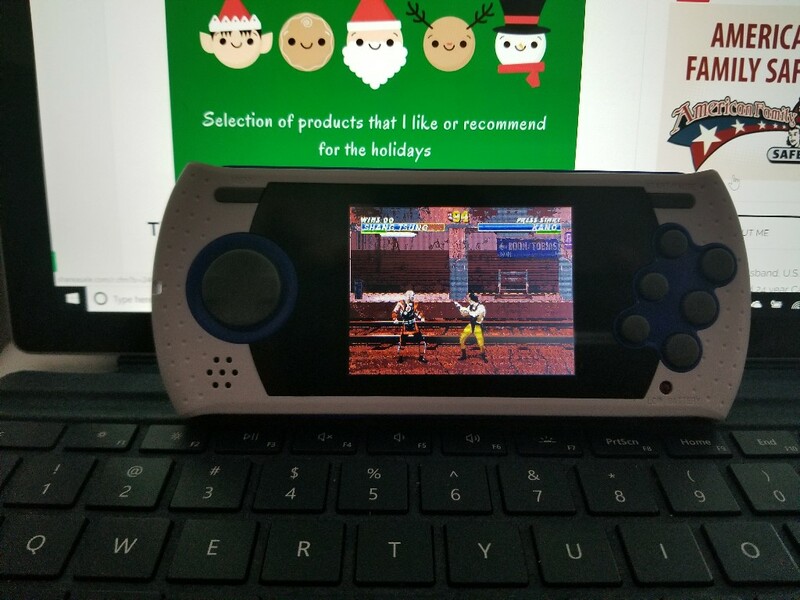 Portable, nice graphics, lots of game, it’ll make a good gift too. That’s pretty inexpensive entertainment. to keep them busy in the car. forgot to add…i think the kids would like all the mortal kombats. This really reminds me of my childhood. I loved these video games. I enjoy that I can share them now with my children. My granddaughter would love this! What a great Christmas gift idea! Boy I bet the kids would love this. They are the gamers in this house lol. Isn’t this cute? This would but a great gift for any gamer at heart. Would keep the kids busy for a couple minutes too lol. I had no idea this was even a thing. GReat price! I like that you can use an SD card to add to your library. Wow…kind of reminds me of the old gameboys. I loved those toys for the kids!!! I have 2 nephews and a grandson who would be thrilled to have the Sega system. Shoot my grown son who drives long haul, would enjoy playing it during those long waits to unload. I wish they would’ve brought more games to it. Also, I hope the battery life isn’t too bad, that would be a killer for me. This looks awesome! My husband and I would love the Mortal combat and sonic games. Thanks for sharing! My son loves any and all things gaming but I’m always so clueless. Thanks so much for the info! Oh my gosh what a fun thing to share with the younger gen. I remember when this stiff came out how awesome. I always wanted a Sega Genesis but only played at friends’ houses. I would love to play Sonic the Hedgehog again; so much fun! I have wondered about these ‘new’ yet old game systems and how they rated. Thanks for the review! My kids played a lot of games on the Genesis console when they were young. I think my nephew might enjoy this. I think my husband would enjoy this the most! I’m too young to remember the saga (born in 1993! ), but he played the old Sega when he was young and reminisces about playing it even now. He’s mentioned “Chakan: The Forever Man” as being one of his favorites! So glad to read this review. I am considering buying one for my grandson for Christmas. It sounds like it’d be a worthwhile investment. The sound could be better I guess, but for him it’s fine. Two of my daughters are big time gamers. They started very young, and in fact the Sega Genesis was one of the first game systems they played on. I know they would both love this! 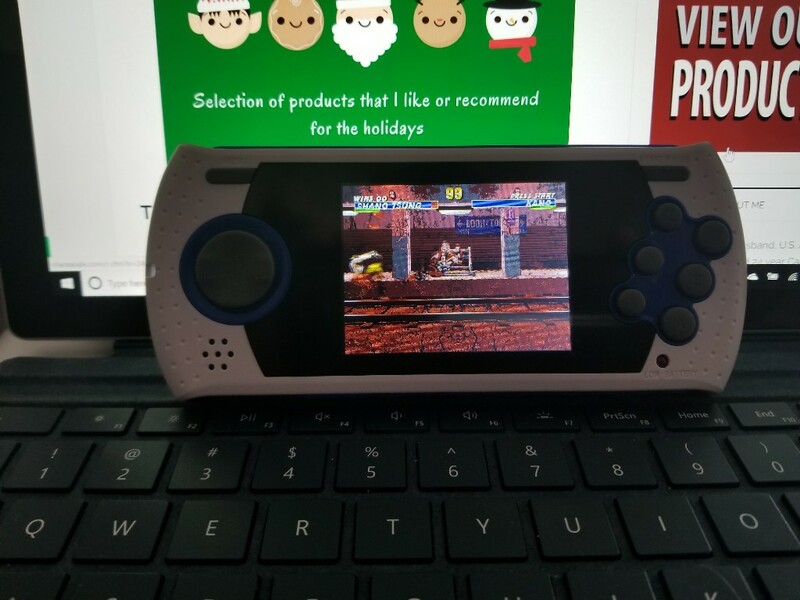 I would enjoy this Sega Genesis portable game system. My favorite genesis game is probably the phantasy star series. Both of my nephews would get a kick out of this. Sega Genesis was a little past my time, lol. Yep, I’m old enough to remember Atari & watching that silly ‘ball’ bounce back & forth on Pong! We were so amazed by that, lol. I do remember my little brother playing Sega, usually Sonic the hedgehog. This would be great for my 11yr old son. Especially on long car rides. I love that its small enough to take with us on trips. Growing up we had the Game Gear. It looked a bit like this portable game player and the game I always loved most with Sega was Sonic the Hedgehog! That melody still rings inside my head from time to time ha-ha. My son loves video games and this is something that he would love to play especially if we had to go on long trips. Sitting in a car can get a bit boring after a while. This would be pretty cool to have for them long car rides with my kids. They all love gaming and they could do it in the car and keep busy. Then at home, dad could play as well. I have always kinda wanted one of these. Ilike games but on the Sega system, I really have only played Sonic and thats about it. I have never had one of the consoles so just havent gotten into it. It looks like a great little device to pass the time though which is a good thing at appointments.